Effective SEO involves a range of different methods. The overall mix of an effective SEO strategy includes a combination of these methods. This generally includes on-page, off-page, local and other factors, but ensuring the fundamental principles of technical and on-page SEO are addressed, is the key to ranking well over time — which is the primary goal of SEO. Without this tool you’ll miss critical data about your site’s performance in Google. It gives you the data to monitor, and then implement and fix technical SEO issues. Google Search Console is also very useful for keyword research, and analyzing UX factors. You connect your Google Analytics from the menu under the gear icon in your Search Console account. Note: Other search engines also have their variation of webmaster tools. 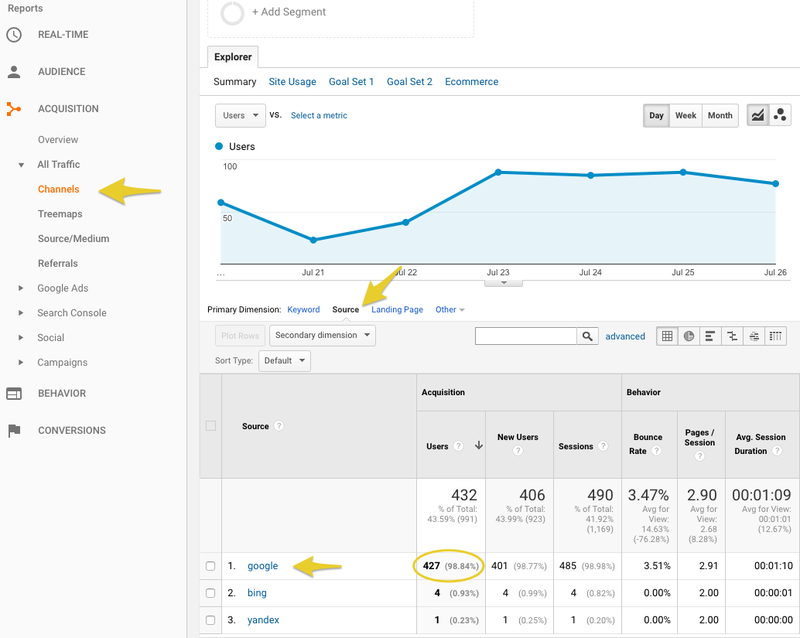 Check your Google Analytics organic search source volumes, and prioritize effort based on that. When your Google Analytics web property is associated with Google Search Console, it gives the ability to see Search Console data in your Google Analytics reports. You will then be able to set up specific reports and goals to track your website’s performance. Google Analytics reports on Organic Search volumes, user engagement metrics and goals will also be key to your ongoing SEO. Most CMS have the ability to manage your SEO. This is likely done through a module or plugin, but make sure you can address important technical and on-page SEO elements — sitemaps, robots.txt, rel canonical, 301 redirects, titles, meta descriptions, etc. If SEO is data driven, it is also very keyword driven. Users start their search with a query in Google. Even if they are use voice search users are likely going to speaking some form of a keyword to start their search. Over-optimization of content. Keyword stuffing can put a domain on the wrong side of Google. You don’t have to follow a magical keyword density formula — just place keywords naturally. Most importantly, think of your users. How can you use keyword placement to make their experience of the content optimal. Tip: Read your content aloud. If it stuffed with keywords you’ll be able to hear it right away. Use keyword variations. Use variations of the primary keyword, like plural or synonyms. Use other keywords that support the topic or ideas behind the primary keywords. For example, the primary keyword is ‘network monitoring’, and a keyword that supports that might be ‘infrastructure performance data’. Tip: Google Suggest, Google Keyword Planner, and communities like Quora, or Reddit are great for researching variations of keywords people are searching for. Your digital experience is about the user, and so is the on-page SEO, but it also also about the search engine. To improve your site’s rankings, provide a clear signal about what your content is about. Internal links. Linking content pages together creates crawling paths for search bots and are an excellent means of funnelling users to a conversion goal. Website structure, navigation, and UX factors. A good guideline to keep in mind is the three-click rule. Users, and search bots, should be able to find any information on a website within three clicks. The bottom line is that a digital experience must be easy to navigate, and the structure simple and cohesive. While SEO keeps evolving, it is important that you lay a solid foundation for success - that starts with Technical SEO.